Damon served as the chaplain at O‘ahu Bethel Church (Seamen’s Bethel) for 42 years, serving the sailors of vessels who entered the port of Honolulu. “Beth-el” was designated as a refuge for sojourners. At that time more than 100 whaling vessels with approximately 6,000 sailors aboard entered the port of Honolulu annually. Materials for the building had been contributed by several ship owners in Norwich and New London, Connecticut. A residence for the chaplain was also built nearby. In the Colonial Records in the Boston Libraries relating to the founders of Scituate, Massachusetts, and their descendants, the name John Damon was spelled Daman. He came to the colony of Plymouth probably as early as 1628, with his sister Hannah and Uncle William Gilson who was their guardian. After the ‘Boston Tea Party’ the Colonists enrolled themselves into companies of ‘Minute Men’ to assemble at a moment’s warning, which was to be given by the ringing of bells, firing of guns, etc; Samuel Damon and Simeon Damon, his brother, were under the command of Capt. Joseph Stetson. Among the men to respond to the ‘Lexington Alarm’ on April 19th, 177 5, enrolled in Captain John Clapp’s Company of Minute men, appear the names of Samuel Damon, Daniel Damon, John Damon (brothers), and Stephen Damon. He married Julia Sherman Mills of Natick, Massachusetts on October 6, 1841. Julia’s uncle, Samuel John Mills Jr, was one of five participants in the famous 1806 Williams College ‘Haystack Prayer Meeting’ that led to the beginning of a secret missionary fraternity called the Society of Brethren, the first Protestant foreign missions organization in America. In 1842, the Damons moved to Honolulu at the direction of the American Seamen’s Friend Society – Damon served as the chaplain at O‘ahu Bethel Church (Seamen’s Bethel) for 42 years, serving the sailors of vessels who entered the port of Honolulu. Damon preached two sermons on Sunday with an additional service on Wednesday. He ministered to the needs of the visiting sailors, which could include food, clothing, and temporary shelter. He encouraged sailors to refrain from liquor and carousing while on leave. He also collected the sailors’ mail until a post office was established in 1851. Concerned with educating his seagoing flock, he collected books on spelling and arithmetic. The Friend described itself as the “Oldest Newspaper West of the Rockies” in the early 1900s; it was a monthly newspaper for seamen which included news from both American and English newspapers as well as announcements of upcoming events, reprints of sermons, poetry, local news, editorials, ship arrivals and departures and a listing of marriages and deaths. In the mid-1800s, many professing Christians migrated to Hawaii from South China looking for a better life working on the Sugar Plantations. In February 1869, with the support of Damon, Sabbath Evening meetings for the Chinese were held under the guidance of Samuel Aheong, a Chinese plantation worker. Samuel and his wife Julia visited missions overseas in Egypt and Syria. They also made a trip to the United States to observe the settlements in California. In 1849 revisited Holden during a trip to the centennial celebration in Philadelphia, to which he was a delegate. 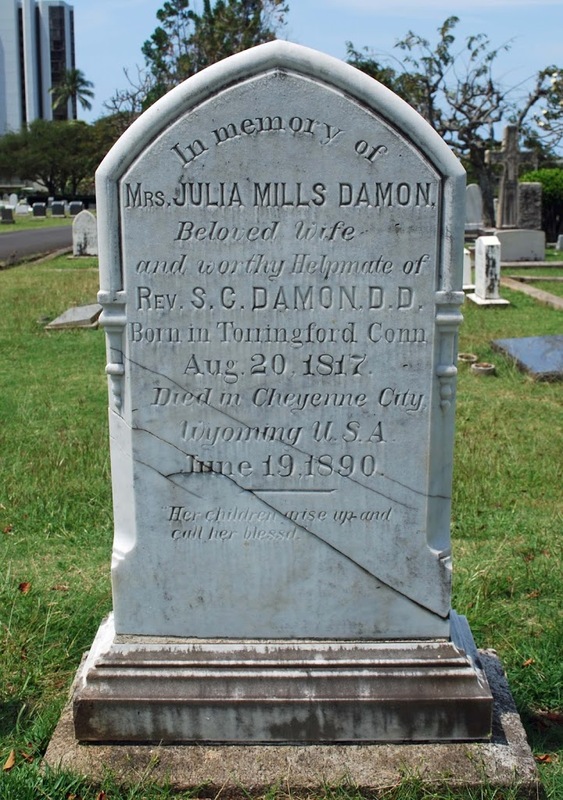 Damon passed away in 1885 at the age of seventy and lies buried at O‘ahu Cemetery. Three years after his passing, his brother-in-law Samuel C Gale gave the citizens of Holden the beautiful Damon Memorial that housed both the Gale Free Library and the Holden High School. The library, said Gale in his dedicatory speech, was Damon’s inspiration. The Honolulu Sailor’s Home remains on Alakea (now a ground floor space in a Honolulu high-rise at 707 Alakea, near Nimitz) as a non-profit lodge for merchant seamen (rates start at $25 per night for a single room.) Their website notes they are accepting retired seamen to lodge for a duration of up to 3 months at any one time (with certain limitations). The display of objects of interest had an earlier history in post-contact Hawai‘i. In 1833, Seaman’s chaplain, Rev. John Diell, began displaying artifacts in the basement of the Seaman’s Bethel (church) in Honolulu, attracting the occasional interested visitor. Diell enlarged his collection in 1837, seeking to preserve the objects of what he saw as a dying race. He named his new “museum” The Sandwich Islands Institute. It opened with among other odd curiosities, a large black bear and snow shoes. After a short time, the museum at the Bethel closed; relics of its brief existence may have found their way into Bishop Museum and the Hawaiʻi Public Library. In later decades, the Hawaiian Kingdom government came to recognize the value that a museum might offer as a site of cultural preservation and national voice. The Hawaiian National Museum opened in 1875, during the reign of King David Kalākaua, as a small collection with a meager budget. It was housed in an upper room of Ali‘iolani Hale, the government building. As Kalākaua began to focus his attention on nationalistic projects he would increase the museum’s budget ten-fold and name Emma Nakuina, the museum’s first native curator, as head of the institution. However, in 1887, the newly imposed “Bayonet Constitution” greatly curtailed the king’s power and slashed funding for the National Museum. Discussions soon began concerning a possible transfer of the government collection to Charles Bishop’s proposed museum. Pauahi, as a member of the royal family and mo‘opuna kuakahi (great granddaughter) of Kamehameha I, had inherited many treasured objects, including the collection of her cousin, Princess Ruth Ke‘elikōlanii (1826-1883). The preservation and display of these objects had been a desire of both of these chiefly women. When a third high ranking chiefess, the former queen, Emma Rooke (1836-1885), passed only a year after Pauahi her significant artifacts joined the others, forming the foundational collection of the proposed new museum. 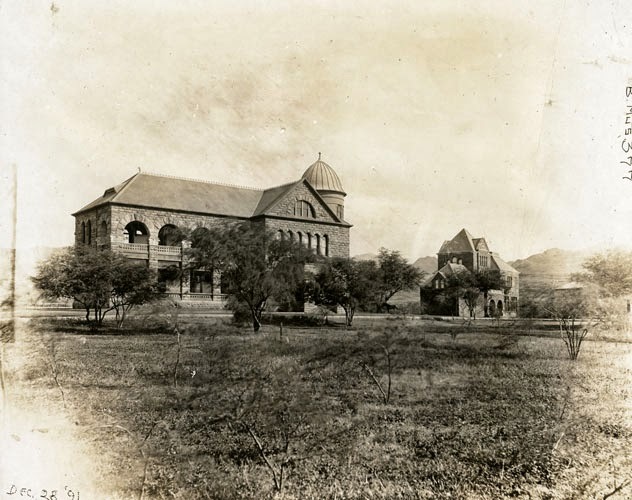 Construction of the Bernice Pauahi Bishop Museum began in 1889 in Kalihi-Pālama on the grounds of the campus of the Kamehameha School for Boys. The museum opened to the public in 1892, and later added Polynesian Hall in 1894, and the “Victorian masterpiece” named Hawaiian Hall in 1903. In January of 1891, word arrived by ship of the death of King Kalākaua. Museum Director William T. Brigham, reportedly anxious over what might become of the national collection, collected and transferred many of the artifacts to the newly founded museum now under his direction. On June 22 of that same year the museum opened to the public with a mission to “preserve and display the cultural and historic relics of the Kamehameha family that Princess Pauahi had acquired.” The nation’s new sovereign, Queen Lili‘uokalani, was the first guest. After a 3-year facelift, the museum’s 3-floor, Hawaiian Hall was reopened. The first floor is the realm of Kai Ākea (which represents the Hawaiian gods, legends, beliefs and the world of pre-contact Hawai‘i.) The second floor, Wao Kanaka, represents the realm where people live and work; focusing on the importance of the land and nature in daily life. The third floor, Wao Lani, is the realm inhabited by the gods; here, visitors learn about the aliʻi and key moments in Hawaiian history. Then, recently, the Pacific Hall, a gallery of two floors representing the peoples of Pacific cultures across Polynesia, Micronesia and Melanesia, was renovated, restored and reopened. Founded in 1968, the Hawai‘i Museums Association (HMA) coordinates communication and cooperation among the staffs and supporters of Hawai‘i’s museums. HMA is the primary provider of museum training programs in the state of Hawai‘i. It serves the museum field with an annual conference on current issues in the museum field and seminars in specialized areas of museum work such as collections management, exhibition design, and educational programming. The inspiration and much of the information here is from Bishop Museum (the image shows the museum in 1891.) In addition, I have included some other images of the Bishop Museum in a folder of like name in the Photos section on Facebook and Google+.